I have always been a huge fan of Alice in Wonderland. I have distinct memories of reading the book as a little girl, and of course, seeing the movie — but I also have the most vivid memories of listening incessantly to a Disney LP version of it. 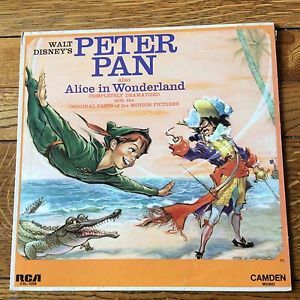 The flip side of the LP was Peter Pan, so between Alice and Peter, I can’t even begin to tell you how many wonderful hours of imaginative fun I had listening! 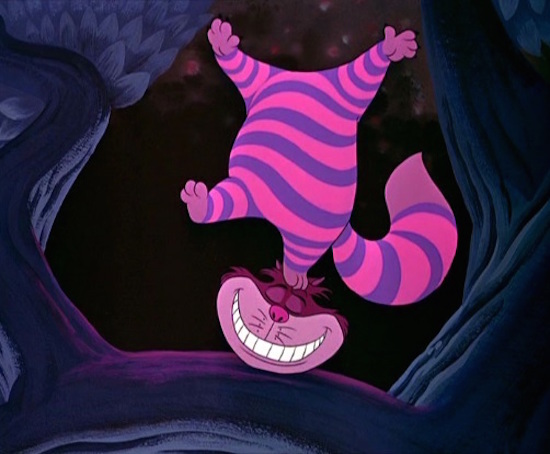 But — what I remember most about that LP, was the super soft sounds of Sterling Holloway as The Cheshire Cat. Alice: Why, why you’re a cat! Alice: I just wanted to ask you which way I ought to go. Just one of his many talents! Alice: I want to go home, but I can’t find my way. 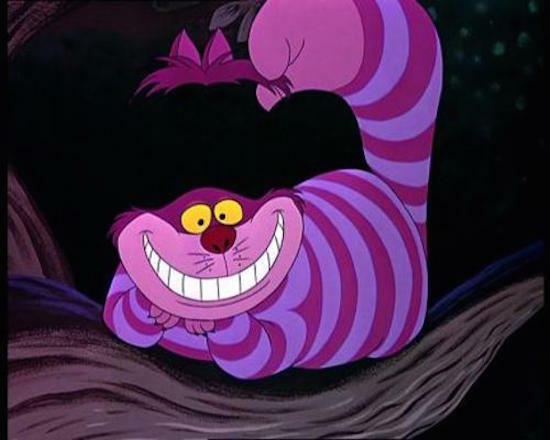 Cheshire Cat: Naturally, that’s because you have no way. 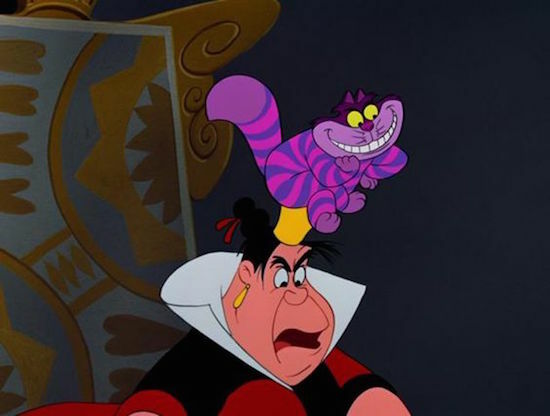 Cheshire Cat: All ways here you see, are the QUEEN’S WAY! 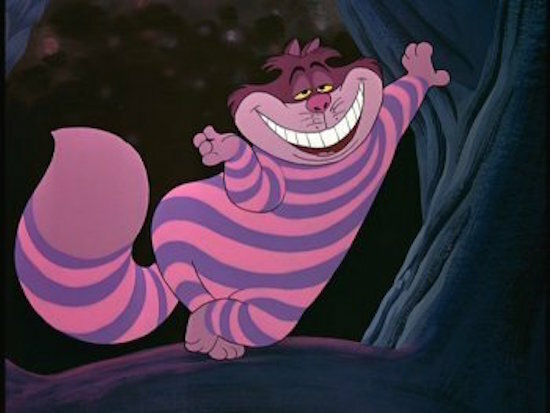 Cheshire Cat: You haven’t? You ha-VEN’T? Oh, but you must! She’ll be mad about you, simply mad! Queen of Hearts: And uh, what were you saying, my dear? Queen of Hearts: Off with her head! This entry was posted in Blogathons, Posts by Annmarie Gatti and tagged Alice in Wonderland 1951, Animals in Film Blogathon, The Cheshire Cat. Bookmark the permalink. Pingback: THE ANIMALS IN FILM BLOGATHON HAS NOW ARRIVED – In The Good Old Days Of Classic Hollywood. I love how that album was so important to your young self. I’m constantly tickled by the outlandishness of “Alice in Wonderland” and frequently awed by the glorious animation of this Disney production. Alone at home yesterday, for no apparent reason, I started walking around and singing “Twas brilig & the slithy toves & did gyre & gimble in the wabe”. I’m no Sterling Holloway, but I thought it sounded pretty good and it made me very happy. Ah well, we’re all a little mad around here, aren’t we? LOL! Oh that is just wonderful! And, yes, I think we all are a little mad around here 🙂 Have a wonderful Memorial Day! I remember being fascinated and puzzled by this film as a child. 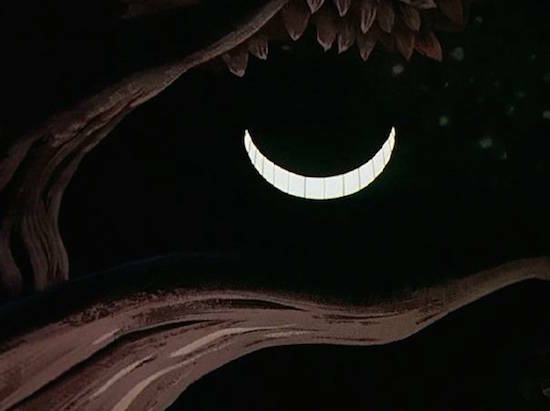 I haven’t seen it since, but the one scene that sticks with me is Alice’s conversation with the Cheshire Cat. I remember thinking that being able to remove your head and then standing on it would be a very exciting thing to do. 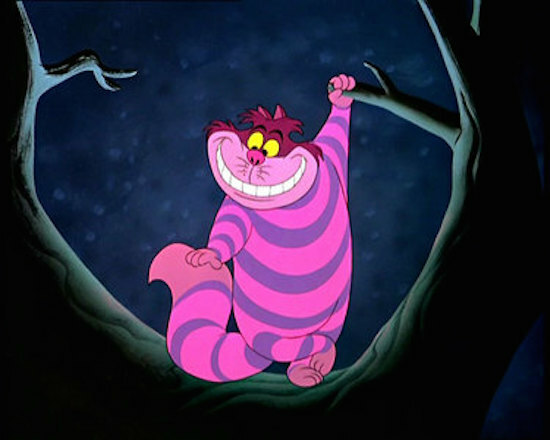 I love that you chose the Disney Cheshire Cat for the blogathon. He doesn’t seem to get a lot of love these days. Thanks so much for participating in the blogathon, and thanks for your great article on “Alice In Wonderland”. I remember watching “Alice In Wonderland” as a kid but I haven’t seen it since. I will have to revisit it. I’ve also just announced another blogathon. This time the theme was suggested to me by another fellow blogger. Would love to invite you to join in. The link is below with more details. It was such fun to participate… If I can join the Joan one I will… 🙂 THANKS for hosting such a fun event! 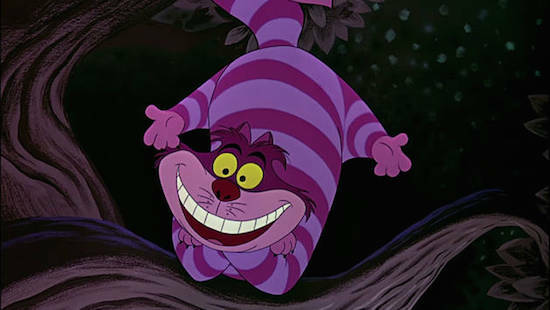 The Cheshire cat could easily have been the scariest thing in Alice in Wonderland, but Disney managed to turn it into one of the cutest. I also like how he moves and disappears. Now I have to watch the movie in English in order to catch all puns and smart cat phrases that were lost in translation!